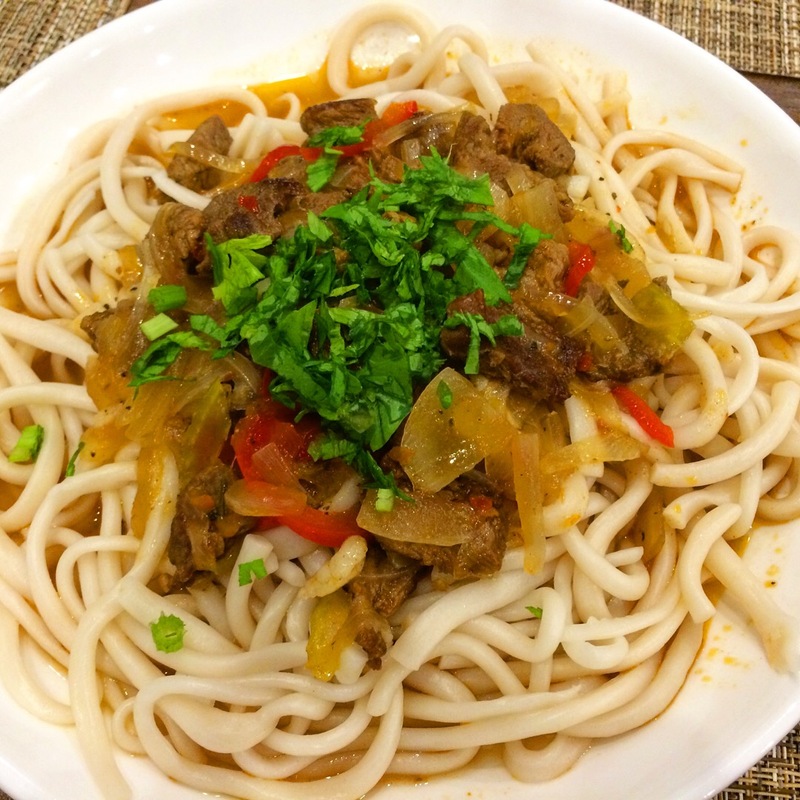 The recently opened Lagman House at 2612 East 14th Street in Sheepshead Bay, Brooklyn, is New York’s first restaurant to feature Dungan cuisine. “Dungan” refers not to a geographical region but rather a Muslim ethnic group that settled in western China in “the Stans” bordering Russia. The language is an offshoot of Mandarin Chinese and is spelled in Cyrillic; if you can speak “menu Chinese” and read a little Russian, you’ve got it knocked, but it’s all there in English as well. 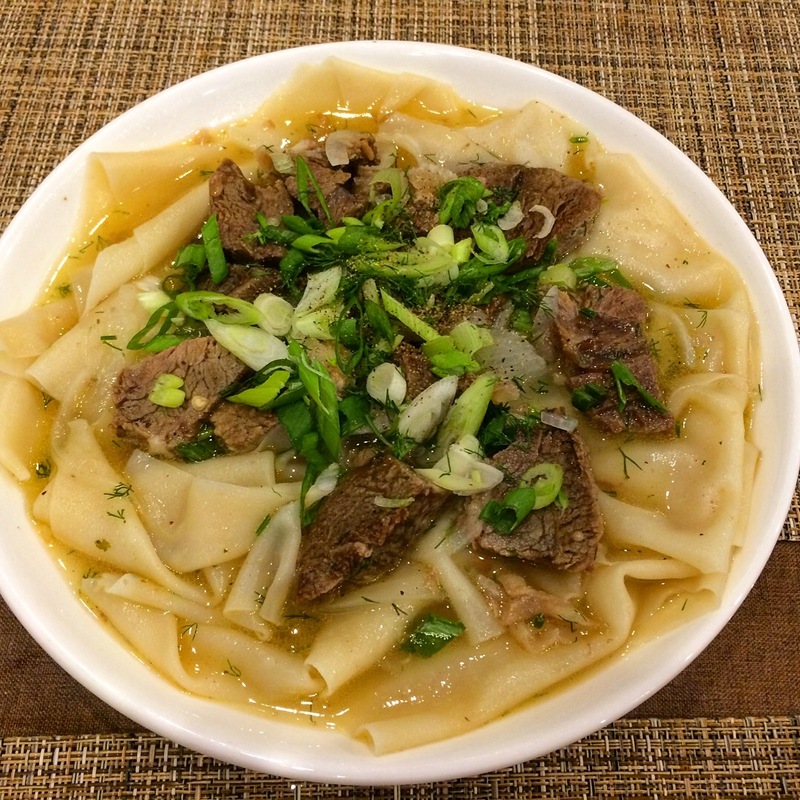 Beshbarmak – often referred to as the national dish of Kyrgyzstan: thick, hand rolled dough cooked in broth and topped with meat. The menu indicated that it could be ordered with either lamb (which would have been my choice) or beef but we were told that since there wasn’t enough call for lamb, they no longer offered it. If necessary, I will single-handedly bring in enough lamb-lovers so that it will take its rightful place on the table! In the meantime, this is absolutely a must-do dish when you come – even with beef, shown here. 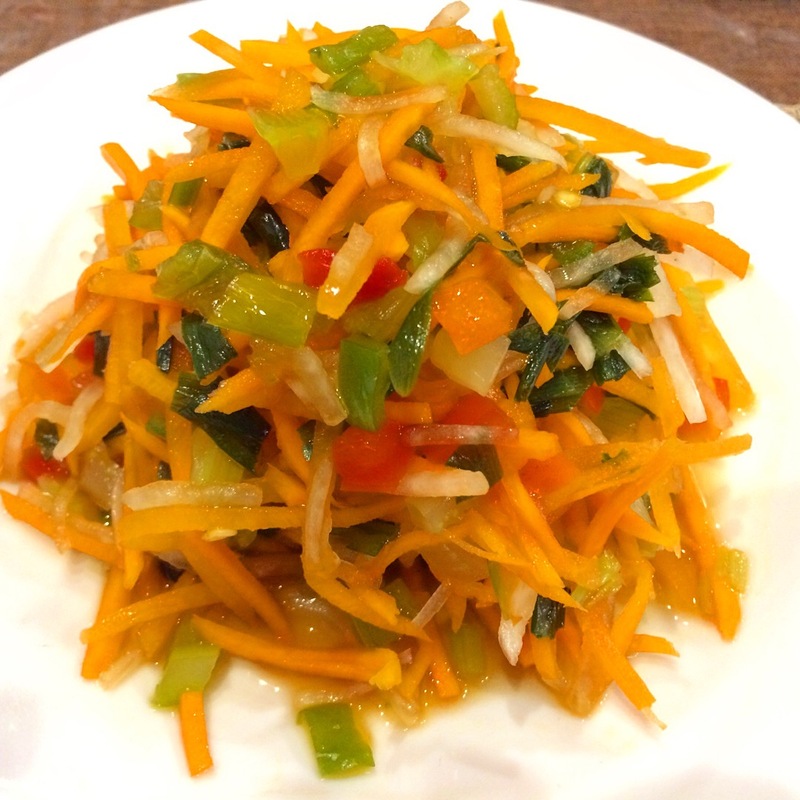 Dungan Style Salad – carrot and radish in a tangy dressing. Our extremely helpful waiter told us we could just eat it straight or mix it in with the noodle dishes for a little extra kick. We did both. 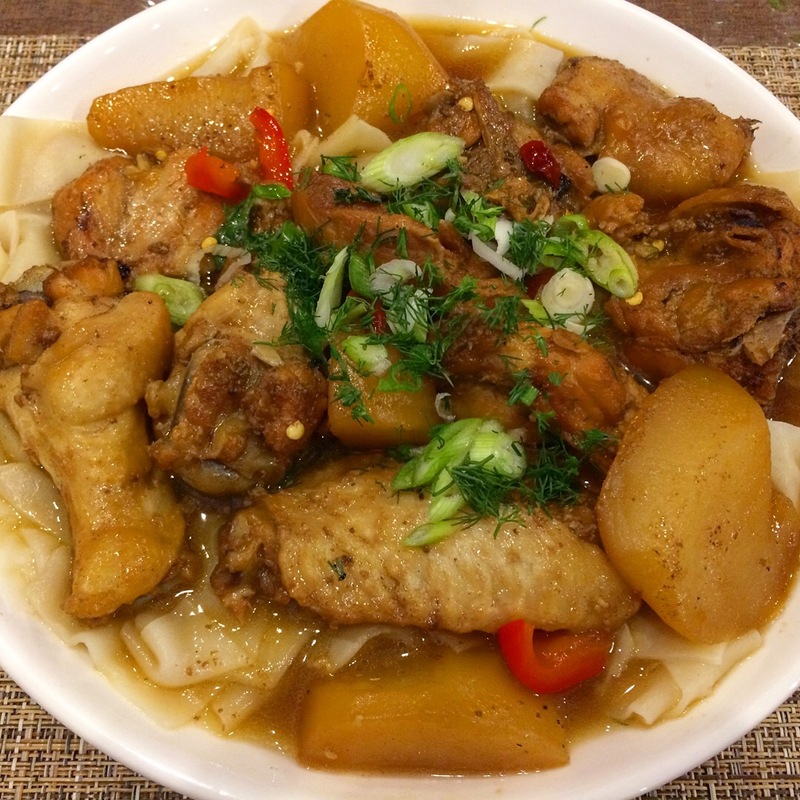 Dapan Ji – handmade noodles topped with “fried” chicken, potatoes, and spicy pepper. Ever had Chinese “Big Tray Chicken”, dapanji? There’s that language connection again. I think these noodles were a bit thinner than those in the beshbarmak and shaped more like the flat noodles you’re familiar with. And we didn’t even begin to crack the menu. More to come! This entry was posted in Instagram, Restaurants & Food Courts and tagged Dungan, Kyrgyzstan by Rich. Bookmark the permalink. Looks terrific. Quite out of my usual traveling range but I would love to try. Very interesting, thank you. I don’t think I’ve had many ethnic foods that belong to a ethnic group that do not have a Country. The one that comes to mind is Basq which I had in Bakersfield CA. which has the largest population of Basq in the country. Oh I’ve also had Acadian in Nove Scotia. Time for you to try Uyghur food, Jerome!